Estadio Hidalgo replaced Pachuca’s previous stadium Estadio Revolución Mexicana. The stadium officially opened on 14 February 1993 with a match between Pachuca and Pumas UNAM (0-1). Estadio Hidalgo got extensively renovated in 2004, which included the construction of a roof over all sides of the stadium, and which raised capacity from an initial 24,000 to 30,000. The stadium received a further minor upgrade in 2011 in preparation for the FIFA U-17 World Cup. Estadio Hidalgo is located in the south-west of the city of Pachuca, about 3 kilometres from the city’s small city centre. The stadium lies right next to the central bus terminal where the long-distance buses from, for example, Mexico City arrive. The bus journey from Mexico City’s northern bus terminal takes about 90 minutes. The stadium is located on the right side of the entrance road to the city coming off the 85 Autopista México-Pachuca. Driving further north brings you to Pachuca’s city centre. Tickets for Pachuca CF matches can be bought online via Superboletos, at the Tuzomania club store at the Blvd Everardo Márquez 210 (near the centre), or at one of several other sales points. Tickets can also be bought at the gates of the stadium on the day of the match. Pachuca tends to fill up the stadium nicely, but for most matches tickets will be easily available. Standard tickets typically costs either MX$ 70.00, but will be increased to MX$ 120.00 for a few high-profile matches. Tuzos.com.mx – Official website of Pachuca CF. Hidalgo.travel – Website of the tourism board of the state of Hidalgo. We decided to take a trip out of the city (Mexico City) to watch Pachuca CF play. The city of Pachuca lies north-west of Mexico City in the state of Hidalgo, about 1.5 hour by bus from the capital. We took the bus from Mexico’s northern bus terminal (Central del Norte). Buses went every 10 minutes, and were cheap (about MXN 75.00). 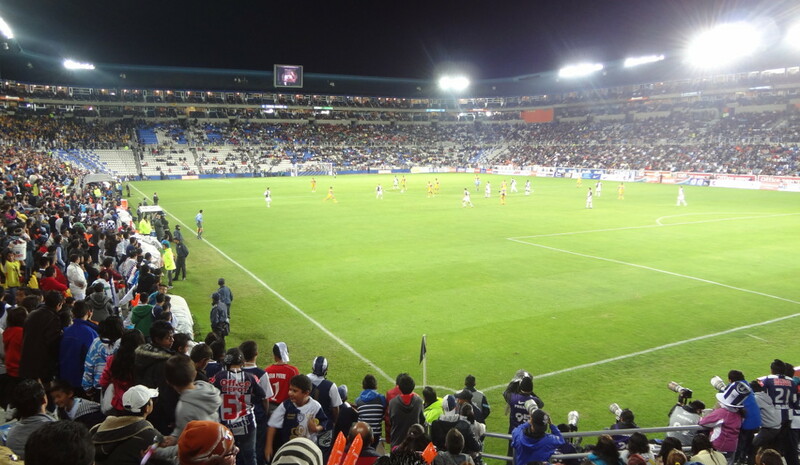 Pachuca generally plays its home matches on Saturdays at 7:00 pm. We decided to go straight to the match as Pachuca city centre is not famous for its beauty or anything else. Due to the typical Mexico City traffic congestion, the bus ride took longer than expected (about 2.5 hours), which meant that we only arrived about 20 minutes before kickoff. The bus terminal is located right across the stadium though, so a 5-minute walk was all what was needed. The stadium is built on top (and half dug in) of a massive concrete-rock mount, which also has the parking lot on top. It makes for a rather odd, but interesting, sight. Not something we had seen before. Tickets were available at the ticket windows (taquillas) right in front of the main entrance. Apart from a few VIP tickets, the club only sells general tickets for MXN 100 (about USD 8.00), which basically gives you the right to sit anywhere in the stadium (apart from some dedicated fan sections). There are no seat numbers, nor any ticket checks at the vomitories (only one at the main entrance). The stadium has a very European look from the inside, with seats very close to the pitch, and good sights from basically any part of the stadium. And it was very well filled too – when we entered it was hard to find free seats in our section. Overall probably 80% to 90% of all seats were occupied. The stadium has a roof, which however only covers the upper rows. On a rainy day it may therefore make sense to arrive early, as all these seats had already been occupied when we entered (it threatened to rain, but never did). The atmosphere was pleasant, very friendly, with a lot of kids and teenagers in the crowd. The Pachuca section of fanatics was rather small though, and did not make much noise. The visiting fans of Tigres were more audible, even though located further away in the stadium. The match was of reasonable quality, with two solid teams. Beers were cheaper than in the capital (MXN 40.00 for a large one), and as usual were served at your seat. It did not take long to get out of the stadium after the match and to get to the bus terminal. Buses generally go back to the capital until 10:30 pm (but in the evening only go every 30 minutes), but the lady at the counter had earlier assured us that enough seats would be available. And indeed, there were plenty of empty seats left. This time the bus ride took as long as promised, and we were back in Mexico City early enough to catch a metro back to the centre.